Absolutely spectacular views from this stylish beautifully appointed home. Onetangi Belle is beautifully positioned with spectacular views of Onetangi Beach, Piemelon Bay, native bush and the surrounding countryside. 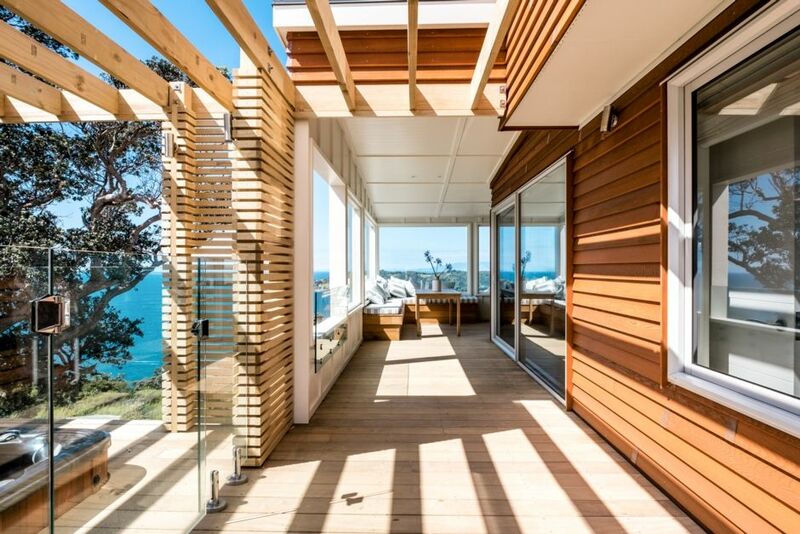 This idyllic beach house is the perfect Holiday retreat and located just a 1 minute drive to Onetangi Beach. The open-plan layout, floor to ceiling windows and seamless blending of indoor and outdoor spaces are drenched in all day sun. - Covered veranda and perfectly positioned Jacuzzi with stunning panoramic water views. - Beautifully furnished and has all the modern requirements of fibre Wifi and Sky TV. Upstairs the master suite encapsulates the entire top floor (with walk in wardrobe and ensuite) all with breathtaking north facing endless views. Downstairs are two further bedrooms, one queen and a single with a trundler which can be made up as a twin. THE DRIVEWAY IS STEEP - and driven at your own risk. We loved our stay at this lovely home. Views were incredible, house was modern yet cosy and comfortable. The only challenge is the driveway which is incredibly steep and a bit of a nightmare for anyone with any sort of disability - having a car that can get up the hill was essential. Would definitely come again, we loved it. Thanks again for a perfect weekend getaway. We loved our stay here! Well equipped and tastefully decorated . Advice to guests if coming on a Friday with a car book a car ferry early! (Maybe add to guest info sheet?) Kids loved the spa, we follwed all the hot tips for a great stay. Lovely spot, with everything you need for a relaxing break. Penny was great to deal with. This house is great. Built at the top of the hill it gets the best views in the area. The rooms are spacious and the house can easily house 6 people. The driveway is very steep though. They were not joking about that. Hi Jeff - it was such a pleasure to have you both stay and thank you so much for taking such impeccable care of the property. We're so glad you enjoyed your time at Onetangi Belle and look forward to hosting you again in the future. Beautiful setting, incredible views , well equipped and stylish but comfortable place to spend time with a small group. Loved everything about the house! Loved everything about the house! Absolutely beautiful - could maybe do with a couple more heaters as the house was a bit cold but we did pick an absolutely dreadful weekend in terms of weather! We can not wait to re book!